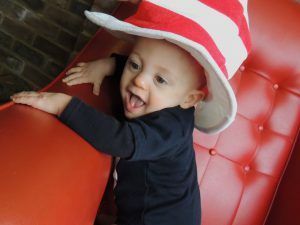 Today Henry is celebrating his first World Book Day out of hospital, which also coincides with Dr Seuss’ birthday(hence the costume!) 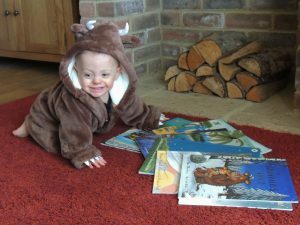 I know he’s not in school yet but as he has such a love for books I felt the need to mark the occasion by writing a blog post and dressing him up! 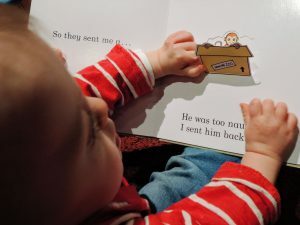 I’ve talked before about the benefits of reading to your baby after Henry featured as poster boy for his neonatal unit’s ‘Books for Babies’ scheme in which every baby is given a book upon admission to encourage their parents to read to them during their stay. When Henry was in hospital we would read to him several times throughout the day and every night before we went home; a routine we have continued since he was discharged last April. 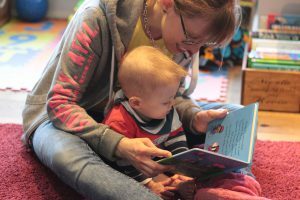 Whether at home or in hospital, reading promotes bonding between parent and baby, babies enjoy hearing their parents’ voices and listening to the words even if they do not understand the stories at first. As a former teacher I am all too aware of the benefits of reading regularly and have seen first hand the difference in children who read compared to those who don’t as teenagers. It is so important to instil a love for reading at a young age so that it becomes second nature as they get older. It has been well documented that children who read regularly achieve better results at GCSE level. 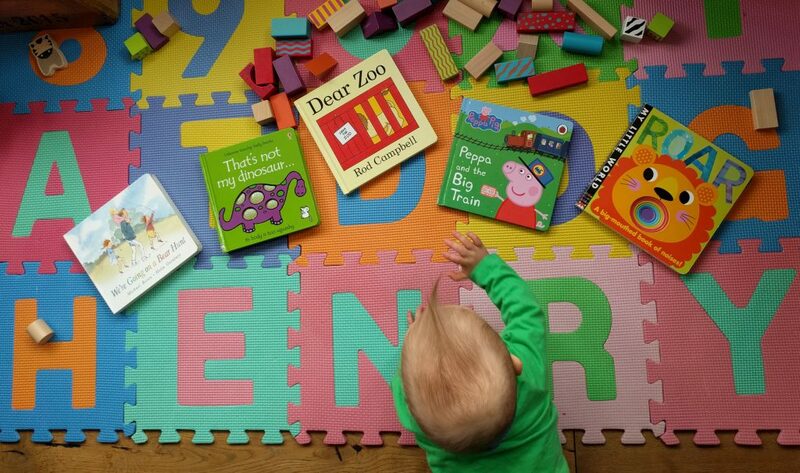 So, as it’s World Book Day I thought I would share with you some of Henry’s favourite books, either to give you some ideas or to inspire you to read to your little ones if you don’t already. I’ve split the list into ‘daytime reading’, consisting of board books that can withstand some heavy-handed page-turning and a coating of drool, and ‘bedtime/hospital favourites’, softback books with good stories that don’t need to be so hard-wearing. We’re Going on a Bear Hunt by Michael Rosen – Henry received this book for Christmas and absolutely loves the repetition presented on every other page. That’s Not My . . . by Fiona Watt and Rachel Wells – We have That’s Not My… Dinosaur but there is a huge collection of books in the series featuring various animals and objects, each one featuring different textures on every page for a truly sensory experience while you are reading. Dear Zoo by Rod Campbell – This is a delightful lift-the-flap book that Henry adores with a different animal on each page, although the lion’s cage has had to be fixed a few times after some overenthusiastic flap-lifting! This is not only a lovely story but it also gives you an opportunity to introduce the baby to different animal sounds (although I was a bit stumped when trying to come up with a ‘giraffe noise’!). 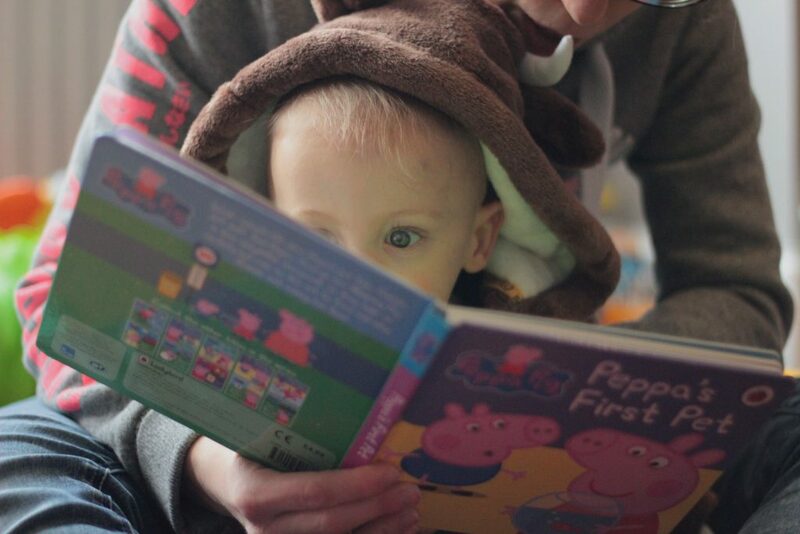 Peppa Pig collection – We are gradually collecting the Peppa Pig books and Henry has loved them all so far. They are full of brightly coloured illustrations and are just the right length for holding Henry’s attention with cute stories about everyday family life. Our favourite being George’s Racing Car. My Little World collection by Jonathan Litton – We have three books in this series now: Roar, Zoom and I Love My Daddy (hopefully the I Love My Mummy one will follow shortly!). They are bigger than the average board book with lovely rhyming stories and beautiful, bold illustrations that never fail to hold Henry’s interest. Virtually any of Julia Donaldson’s books – We loved reading these beautiful rhyming stories throughout Henry’s hospital stay and they are great hits at bedtime now. Our particular favourites include The Gruffalo, Cave Baby and Tyrannosaurus Drip. Charlie’s First Night by Amy Hest – This is a heartwarming story about a boy (called Henry) bringing his pet dog, Charlie, home for the first time. Bringing Down the Moon by Jonathan Emmett – The humorous antics of Mole, who tries to pull the moon down from the sky! It has lots of different characters and is a great one for doing silly voices, my husband and I often try to outdo one another at bedtime with funny voices for each character. Goodnight Harry (we read it as ‘Henry’) by Kim Lewis – A beautiful story about a teddy bear who despite his best efforts is struggling to fall asleep. Can’t You Sleep, Little Bear by Martin Waddell – The story of a cheeky little bear who can’t get to sleep because it is too dark. Usborne’s 100 Illustrated Stories – This is a fantastic collection of fairy tails from all over the world and contains all the classics we all know and love; it was ideal for daytime reading in the hospital as it took up a lot less space than having lots of individual books. The stories are also quite short so we could read as many or as few as we liked in a row. Did you read to your preemie in hospital? What were/are your favourite books to read to your little ones? I’d love to hear your reading stories in the comments below or on our Facebook Page.